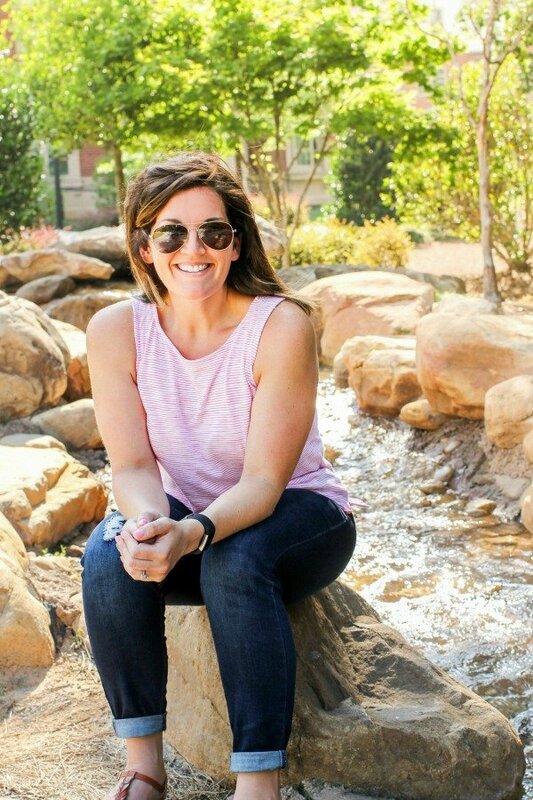 July 31, 2018 By Allyson 52 Comments This post may contain affiliate links. Read my disclosure policy. Only a handful of ingredients in this delicious Garlic Hummus. 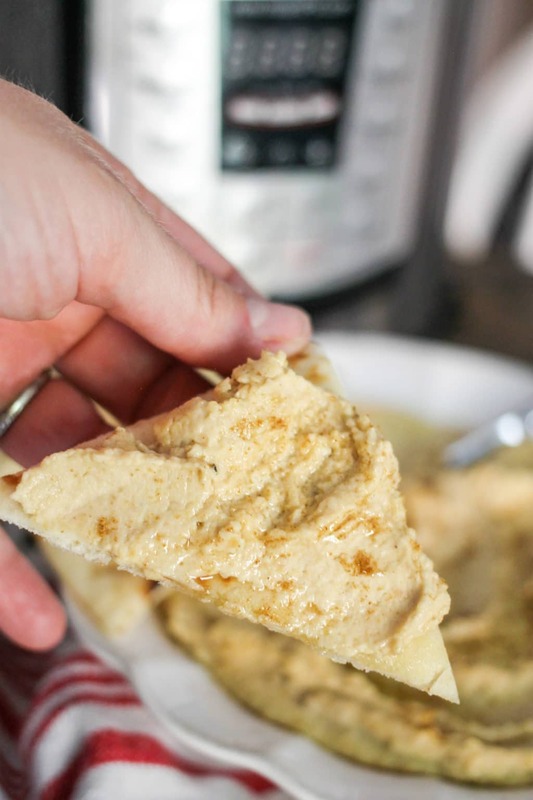 Save money and know exactly what’s in your food with this Instant Pot Garlic Hummus recipe! As vegetarians, my family eats a TON of hummus! 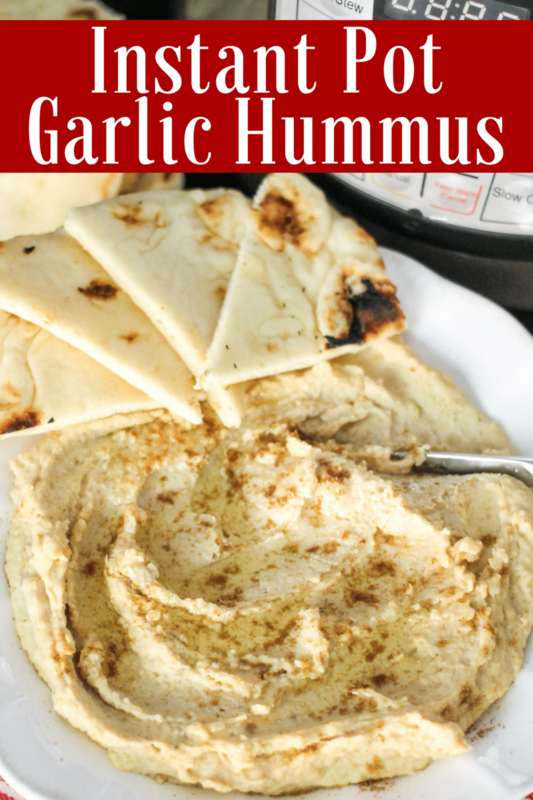 Naturally I love to save money by making it home, but I had never really loved making it until I tried maying this garlic hummus recipe in my Instant Pot. Using the Instant Pot saves so much time, effort, and it turns out incredibly flavorful! Don’t have an Instant Pot? You need to buy one now!! They are life changing because they save so much time and effort!!! I recommend the 6 quart Instant Pot if you have 2-4 people in your family, but if you have more than 4 people, I’d recommend the 8 quart Instant Pot. You can make typical slow cooker recipes in a fraction of the time and so many staples in no time! I love it. When using dry garbanzo/chickpeas, you MUST soak them for at least 8 hours, but preferably overnight. Add the beans to a bowl, then fill the bowl up with water and let them soak. Strain the water from the beans, then add the beans to the Instant Pot. Add water and oil, then set on manual/high for 20 minutes. You should remember when using the Instant Pot, that the time it takes to cook the recipe (20 mins), is not the total time of the recipe. You need to give the pot some time to ‘come to pressure’, and the more water in the pot, the longer this will take. Don’t worry, just let it do it’s thing! While the beans are cooking, roast the garlic (click for directions). Release the pressure manually (flip the valve), then carefully remove the lid. Transfer to serving dish, drizzle olive oil and cumin over the top of the hummus and dig in! Be sure to use the hummus within 5 days of making. Is this Garlic Hummus recipe healthy? Yes, absolutely! Garlic Hummus is full of healthy fats, protein, and fiber. It’s probably the healthiest dip choice available. This recipe has 45 calories, 3g fat, 4g carbohydrates, 1g fiber, 2g protein per 2 TBS serving. Be mindful not to eat a whole bowl in one sitting, and also consider what you are dipping into the hummus. Choosing crunchy vegetables like celery, carrots, broccoli, and bell peppers are all great healthy choices. YES! This recipe makes 4-5 cups of hummus, so it’s great to freeze extra. Place the hummus into a freezer save container, and leave a little room at the top; the hummus with expand as it freezes. I like to freeze in 1 cup portions. To defrost: place into the refrigerator the day before you want to use it. Once defrosted, mix it well (there may be water on top from separation, but that is normal) and serve as desired. Hummus will keep in the freezer for 6 months to 1 year. Tahini paste (blended sesame seeds) – look for this next to the peanut butter and nut butters at the grocery store. You can also find it on Amazon here. A rubber spatula is essential for scraping down the sides of the blender/processor. A lovely serving dish for the garlic hummus. Instant Pot Pumpkin Butter takes only 3 minutes to make, and is a delicious fall recipe that’s perfect on toast, biscuits, or in your favorite dessert! Only a handful of ingredients in this delicious Garlic Hummus. Save money and know exactly what's in your food with this Instant Pot Garlic Hummus recipe! Strain the beans and rinse, then add the beans to the Instant Pot. Add 3 cups water and 2 TBS oil. Set on manual/high for 20 minutes. When time is up, release the pressure manually (flip the valve), then carefully remove the lid. This recipe yields A LOT of hummus; about 4-5 cups. A typical store bought container of hummus is 1 cup generally. Feel free to reduce the recipe size, or freeze the extra to have hummus available all the time (see directions above)! Hummus will stay good in the fridge for 5 days. This recipe has 45 calories, 3g fat, 4g carbohydrates, 1g fiber, 2g protein per 2 TBS serving (does not include toppings or whatever you use to dip into the hummus). We can’t get enough hummus! I can’t wait to use my Instant Pot!! My family would love this hummus! Whaaaaa!? I just got an Instant Pot and have been looking for new recipes to try! I LOOOVE hummus, and I can’t wait to try this! Yes it takes all the effort out! Oooh smart idea to make it in the Instant Pot! Curious, one of the great benefits of a pressure cooker is NOT having to soak dry beans overnight. Why do garbanzo beans need to be soaked? In my opinion, there is definitely a difference in taste of the chickpeas when you soak them as opposed to just cooking them outright in the IP. If you don’t care or don’t notice a difference, feel free to not soak them, but I do recommend it. I don’t find it that bothersome, just dump in a bowl before you go to bed, cover with water, and they are ready when you wake up 😉 Enjoy! Have you tried using a quick soak method in the instant pot? 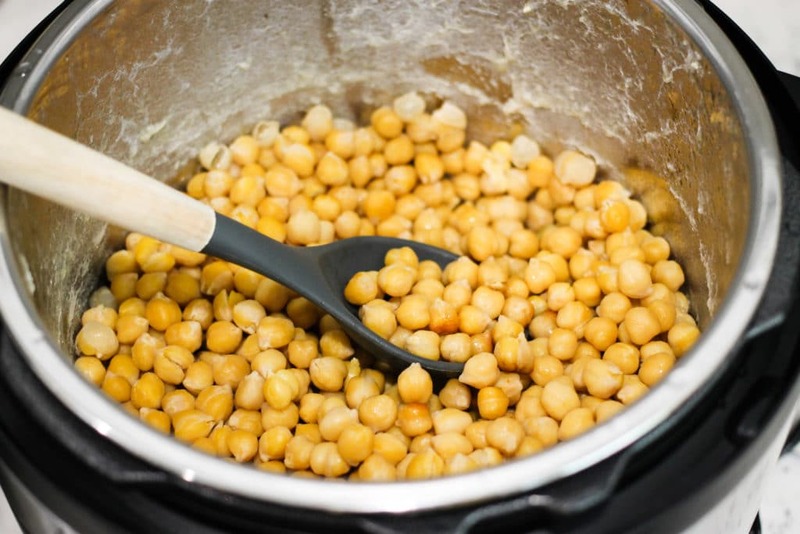 Do you still need to soak the chickpeas if you are using canned? No. If you use canned chick peas you don’t need to soak them at all! I really like that you soak them first… it really does make a difference in the texture! This needs to happen at my house very soon! So hungry for this! I love hummus so much! My life was forever changed the first time I tried making it from scratch with my Instant Pot! I love the idea of roasting the garlic – so smart!! I have never heard of hummus in the Instant Pot. I will have to throw this together soon. Would you cook this with chicken broth for flavor? I wouldn’t, but there is definitely nothing stopping you from trying it! 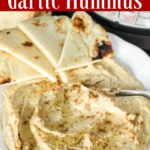 I absolutely love hummus and this one sounds simple and delicious. Making this right now. Garlic is roasting and chickpeas are cooking. Garlic hummus is my favorite kind! I never like buying hummus from the store. So easy to make it at home right! The texture looks perfect. Garlic hummus sounds so awesome. I love the taste of garlic in (almost) everything, can’t wait to try this! You will definitely enjoy it! For extra garlic kick, add more! Awesome! I made two types – olive and red pepper. I’m allergic to tahini so this was just up my alley. I made it without soaking the chickpeas. Turned out great! Thank you! So you made without the tahini? Tasted good? Good tip for people not wanting to use the tahini! What size IP did you use? I have a 3 qt and learned I need to know if I need to 1/2 the ingrediets or make 2 batches. Thanks. This recipe looks delicious. I used the 6qt, but I think you could definitely fit this recipe in the 3qt. In the directions you say in step 1 “Add the spices, roasted garlic, tahini, lemon juice, OLIVE OIL …” but there is no amount listed under the Hummus ingredients, just when cooking the beans. How much evoo do you add please? Hi Hope, you have to scroll all the way down the page to the recipe ingredient list and directions. You will see a box with a recipe, then you can print it or write down the directions from there. Let me know if you can’t find it. Good luck and enjoy! Yes ma’am. I found and read the recipe box, the problem is olive oil is not listed in the ingredient list for the hummus, only for the beans and then as an optional topping however there is no oive oil listed in that section. Here is the ingredient list for Hummus. Transfer the beans to a high powered blender or food processor. Add the spices, roasted garlic, tahini, lemon juice, OLIVE OIL….. This recipe looks very interesting but I’m confused as to how much olive oil should be added in this portion of the recipe. OH!!!! Good find, Hope! Add 1 TBS! Fixing now! Can I make a Lemon Hummus like this? I could eat hummus by the gallons! This recipe looks especially easy and yummy! I love homemade hummus, after making it from scratch I don’t think I can ever buy store bought again! 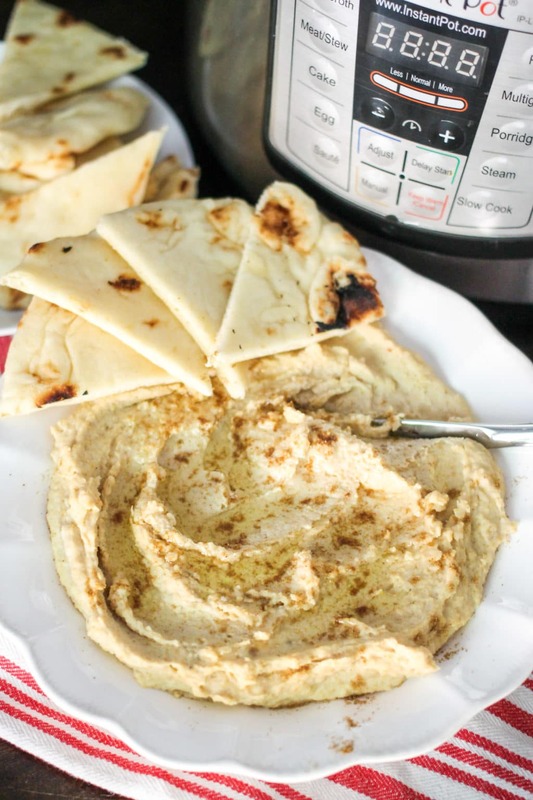 I had NO IDEA you could make hummus in an instant pot. LOVE this idea. Sounds delish too! I love hummus! But I’m still afraid of my instant Pot! I suggest you fly to Atlanta and I will give you a private lesson 😉 It’s so easy!!! This recipe is genius and sooo easy! Thank you! If I use the canned chickpeas do I just skip to blender step or do I need to use the InstaPot? You don’t need the instant pot if you use canned beans. I would just probably heat them up a bit before you blend so they are softer. Hi there! I have a couple of questions. 1) Does 16 oz of dry chickpeas equal to about 4 15 oz cans of chickpeas? 2) You mentioned that the hummus should be eaten within 5 days and I was wondering why. Thanks! Yes, since I made this recipe with dried chickpeas, the ingredients may have different ratios if you use something like canned beans. Add the water as needed and go from there 🙂 Good luck! Has anyone deshelled their dry chickpeas and has it made a difference in the taste & texture? I am excited to try this; should I use tahini that has been roasted or unroasted? I have seen both varieties while shopping and have enjoyed both though not sure which is usually in hummus. Thanks.